The music is electronic, forged in Stockhausen's studio through meticulous manipulation of tapes, electronic signals and, in the later stages of its evolution, computers. The work is played through an elaborate eight-speaker sound system (of Stockhausen's own design) mounted at the corners of a vast, imaginary cube. In the opera itself, the work serves as backing track for the smack-down between angels, which are in turn portrayed by small armies of trumpets and trombones. This did. 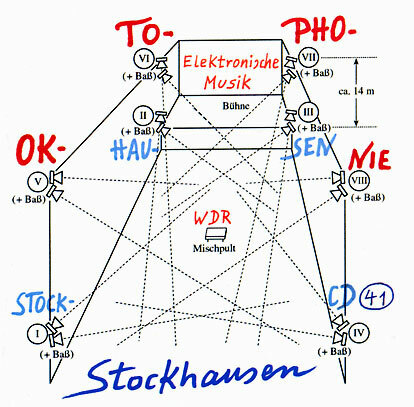 Stockhausen's original plan for Oktophonie. The Drill Hall provided an ideal environment for this decidedly unconventional concert, with the audience placed squarely in the middle as participants in the show. After removing their shoes, audience members donned white cotton cloaks and walked with padding feet to the performance space, a circular, carpeted surface dimly lit from the lighting rig above. Settling into back-rest seats with their legs on the floor, the listeners waited, participants in an unearthly cult. Darkness engulfed the little group, the only illumination from the mixing board and light controls where a white-cloaked acolyte prepared to start the rite. The first waves of sound were low, heavy pulses of bass, shuddering and shimmering through the floorboards of the room. These were joined by keening glissandos, the tap and tump of marimbas and percussion, and the odd chord. The music and strange environment left the listener with a feeling of weightlessness, straining at the dim, overhead light show that was occasionally interrupted by sodium and crimson beams of illumination designed by Rirkrit Tiravanija. 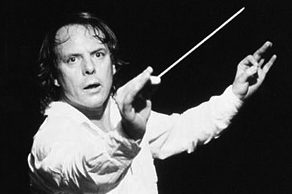 Stockhausen's long piece divides neatly into ten-minute movements, with each chapter coming to a close like a section of block chords from a Bruckner symphony. The intensity of the work ebbed and flowed, messing with the listener's perceptions and drawing one into the spacy, beat-less intensity of the electronic trance. It was easy to hear this composer's wide influence on the art-rock of the 20th century, and to see how his compositional techniques drew on the works of other pioneers like Varése, Boulez and Carter. As Oktophonie wound forward, ideas repeated and cells of notes joined each other, only to be dissipated and deconstructed again. The final section had hints of actual melody, an idea and theme pushing through the electronic soup in a heroic struggle toward a coherent thematic statement. The final coup was a slow fading away of the final pulses. As the sounds diminished to silence, the overhead lights were turned up to a brilliant white. All the colors combined with the audience exalted as if bathed in a new sun after the long dark. Illumination had come at last.